Well, that was an uncomfortable watch. In more than forty years watching Saints I can honestly say that was easily the worst home defeat that I have ever seen, yet without the team playing that badly. Yes, Caulker was poor, but we knew that anyway. Yes, we really missed Fonte's calm organisation at the heart of the defence. Yes, the midfield still isn't right, but isn't that much wrong either. It has to be said that Ronald Koeman got the team chi=oice wrong again. Personally I would rather have seen Yoshida at centre half, rather than Caulker, but that shouldn't have been a big deal. The mistake, which he admitted afterwards, was in his team reorganisation when chasing the game. That just made an already bad situation worse. However, the real difference was essentially Jurgen Klopp. What a huge change he has made to a previously less than average Liverpool team in such a very short time. I mean, even Lovren looks like a professional footballer again! I could go through the game blow by blow, but I admit that the second half just passed me by in a daze. I think that I gave up watching (although I didn't leave my seat until the final whistle) after the fourth goal went in. If the players were having an off day there would be something I could get my teeth into, but honestly it just did not feel like that. The referee let some Liverpool fouls go, but that is just normal stuff. I have seen some say that Stekelenburg was at fault for at least a couple of the goals, but that didn't seem like it from where I sat. The problems were in front of him and they were wearing black shirts. The game started so well. There were some issues with the new'ish security arrangements and there were still a fair few people getting into the ground at kick-off. The main interest from those around me was what on earth van Dijk was wearing on his head? 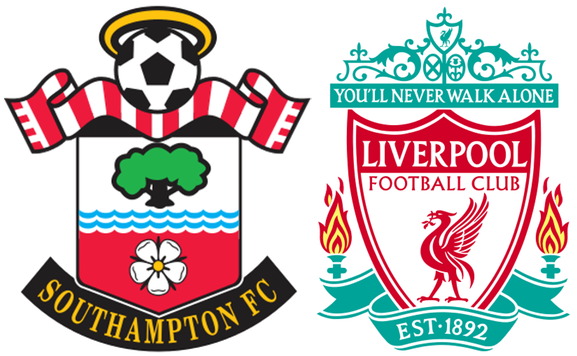 Saints kicked off towards the Northam end and the ball was played out to Bertrand on the left, who straight away went to the byline and floated a wonderful cross into the penalty area, which Mané rising above everybody, buried in the net. 1-0 and only 39 seconds gone. In the general hilarity we were not to know that was as good as it got. For the first twenty minutes Saints played reasonably well, there was certainly no indication of what was to come. In fact, when the equaliser came, it was against the run of play and Caulker just did not seem to defend. Sturridge was way too quick for him, with physically and mentally. Stekelenburg had little chance against that sort of situation and he hit the ground in frustration as the ball nestled in the net behind him. What changed the complexion of the game was the second Liverpool goal which followed just four minutes later. Again it was Sturridge and again Liverpool were like lightening on the counter. It reminded me of Saints in the Pochettino era, pressing, pressing and more pressing. They were working their socks off and Lallana in particular looked good. He got a torrid time from some sections of the ground, but IMHO that is all water under the bridge and I would prefer to think of all the good things that he did for us. I think the Klopp era at Liverpool is tailor made for him and he will thrive now. I really don't know why Rodgers struggled so much with this squad. There were now the first signs of Saints heads going down, as it didn't seem to matter what they did, they just could not inflict any panic in the Liverpool defence, who seemed well in control. Pellè in particular was not allowed any time at all on the ball. There was still the feeling that the tie was up for grabs though. It just needed Saints to generate that moment of magic from the front three. Tadić seemed the most likely to provide it, as he was putting the Liverpool right back under all sorts of pressure. Then, right on half-time Origi scored what was to be the first goal in a hat-trick, with a deflected shot through a crowd of players. That was a deep phycological blow and Saints players went off for half-time looking bemused and crestfallen. The second half was all about Liverpool, they were rampant. I am not sure that there were any positives at all. The changes that Koeman made only succeeded in making things worse. The final straw was the changes at 63 minutes when he went to 3 at the back. Unfortunately they were Caulker, Wanyama and van Dijk. So, in effect we had a back one of van Dijk. Wanyama in particular had just not been effective in midfield, but I suppose Koeman had just run out of options. Anyway, Origi rattled in goal numbers four and six for his hat-trick, with Ibe scoring the fifth and that was the League Cup for this year. We had tried to go toe to toe with the new look Liverpool and got our backsides kicked. The only good thing to say, is that we have the next game against Premier League bottom side, Aston Villa on Saturday. Though who is to say we will be able to win that, after losing three games in a row, each one more comprehensively than the last?